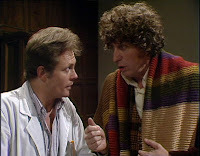 This week I come to Tom Baker’s fourth season in the role. From the point of view of the costume changes, this season is a bit confusing as it was shot drastically out of order. This was done to allow the permanent inclusion of K-9 after only intending to be a one-off character. However, this lead to some continuity anomalies, especially for Leela’s look which was updated for Image Of The Fendahl (see right). Since the following episode (The Sun Makers) was already shot with the original costume, a scene at the end was added with Leela returning to the old look (see far right). 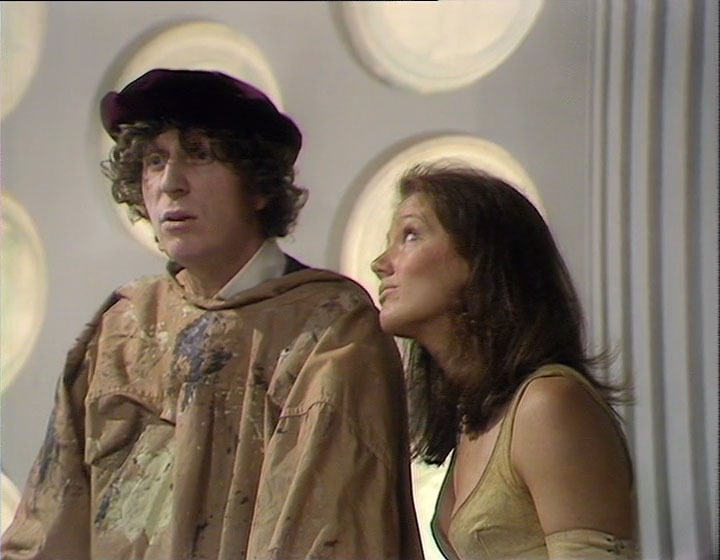 The Doctor wore his grey frock coat for the first three serials to be recorded, then the velvet one for the rest. By flipping the third and fourth adventure before broadcast, it makes it look like he chops and changes. The introduction of a different scarf for Image Of The Fendahl also becomes messed up when the already shot The Sun Makers is shown after it, using the older version. 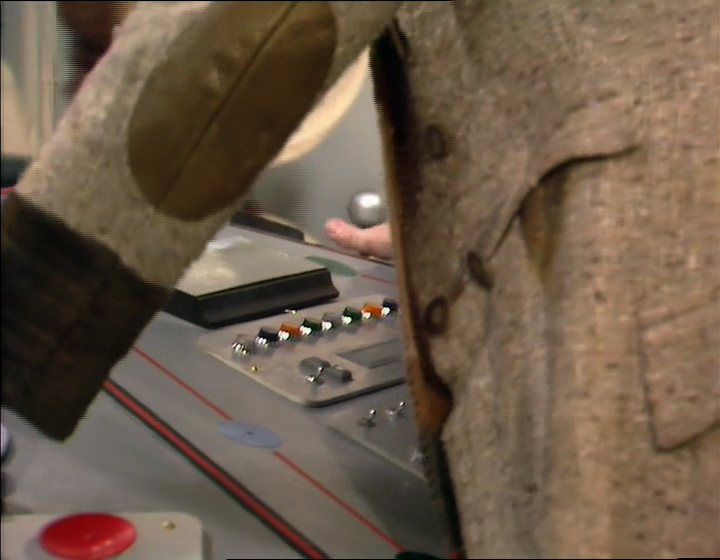 The season opens with The Doctor wearing his grey Tweed frock coat first seen in The Android Invasion. We haven’t seen this coat since the season 13 finale, The Seeds Of Doom. The button-link used to close the coat is hanging in his lower lefthand buttonhole. With the coat he wears the Donegal tweed trousers; the printed velvet Prince Of Wales checked waistcoat; over the white Victorian shirt with stand-up collar. He briefly wears his brown fedora hat, not seen since The Android Invasion. For a fair part of episode one he wear a brown derby bowler hat picked up in the lighthouse (see right, second picture). He wears the duplicate scarf throughout the serial, draped around his shoulders and often with both ends flipped over his right shoulder (see right, middle two pictures). Although we don’t get a good look at them he appears to be wearing a new pair of black ankle boots. Instead of a cravat, he now wears the dark red tie with burgundy polka dots worn in the previous season finale, The Talons Of Weng Chiang. This won’t be the last piece of costume plundered from the apparently one-off Sherlock Holmes inspired outfit. The first Doctor costumes we see in this serial are on the console room hatstand, which Leela is repositioning while wearing his bottle green fur felt fedora hat. 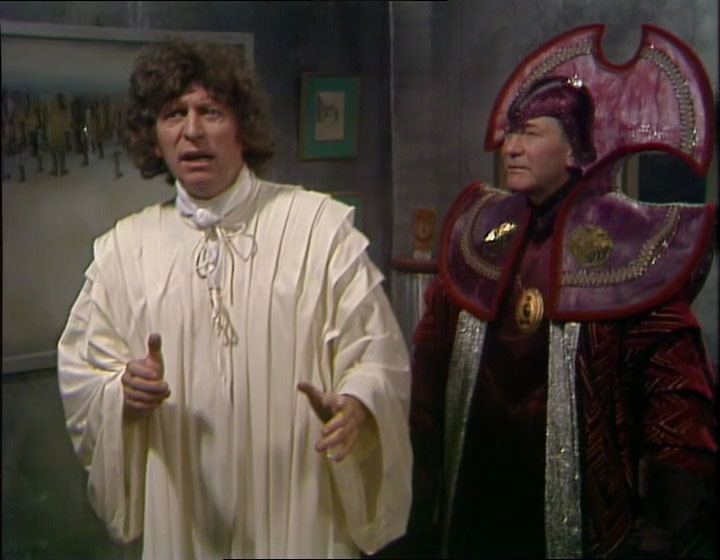 On the stand are the burgundy velvet frock coat from Pyramids Of Mars; the Inverness cape and deerstalker from The Talons Of Weng Chiang; and the corduroy shooting jacket from season 12. The Doctor wears the same costume as he wore in The Horror of Fang Rock comprising of his grey Tweed frock coat; printed velvet Prince Of Wales checked waistcoat; over the white shirt with stand-up collar; dark red silk tie with burgundy polka dots; and grey Donegal tweed trousers. We get a good look at his new black ankle boots, which appear to be those worn in The Talons Of Wang Chiang. Throughout the serial he wears the duplicate scarf draped around his shoulders and often with both ends flipped over his right shoulder. One curious thing I spotted on the frock coat is the elbow patches, which are in two parts sewn into the back seam of the sleeve (see below). If you remember, one button was missing from the top of his lefthand side of the coat. The most noticeable part of his ensemble is the debut of a new scarf. Although following the same general colour scheme as the previous scarves, most of the colours are wildly different in hue and saturation, particularly a lighter grey and darker green. The scarf is also noticeably wider, longer, and has larger stitches than the previous ones. 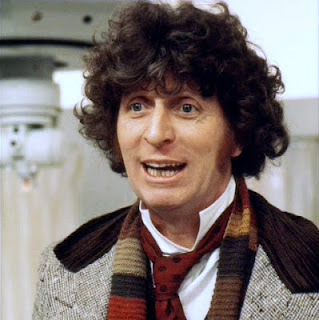 Although the scarf is longer, the Doctor still wears it the same way he did the previous one, draped around the neck with both ends thrown over his right shoulder to keep them from dragging. Worn unfolded, it creates a sea of knitting across his upper body! Tom’s habit of sticking his fedora in his coat pocket is now putting a noticeable crease down the middle of the brim and band (see left, bottom). The console room hatstand comes into use again at the start of this serial, but lacks the usual collection of costumes. 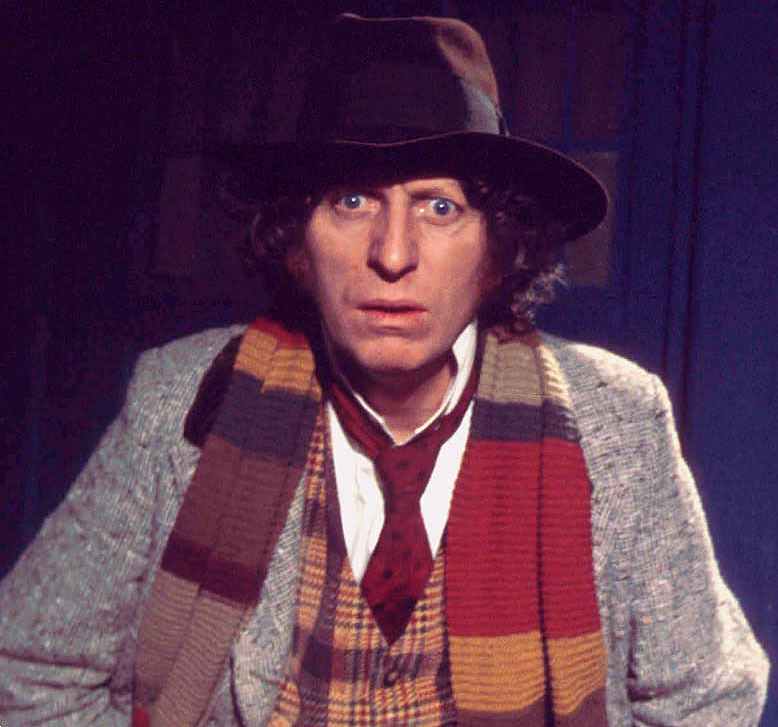 All it contains is The Doctor’s hat and scarf, which he collects before returning them at the end of the final episode. Having been filmed before Image of the Fendahl, The Doctor is back to his outfit still warm from the recording of Horror of Fang Rock. This comprises of his grey Tweed frock coat; the printed velvet Prince Of Wales checked waistcoat; over the white Victorian shirt with stand-up collar; the dark red tie with burgundy polka dots; dark brown fedora hat; Donegal tweed trousers; black ankle boots; and Duplicate scarf. Again, the Doctor folds his hat to put it in his coat pocket, which puts a visible crease down the front of the brim (see right, second picture). For one scene he looses his coat, which shows of the full sleeves of the Victorian shirt. 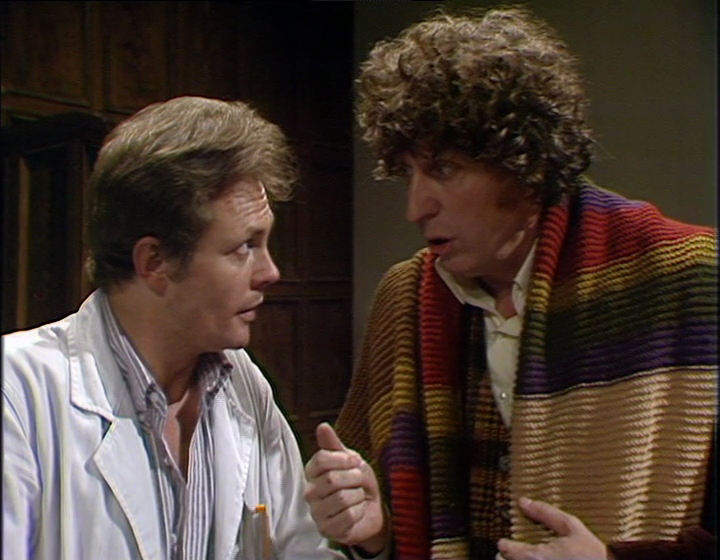 During this scene we get another good look at The Doctor’s black ankle boots worn for the two preceding recordings (The Invisible Enemy and Horror Of Fang Rock). It is clearly visible during this story that the coat is missing one button from the top of his lefthand side, and one from the bottom of his righthand side (see left). 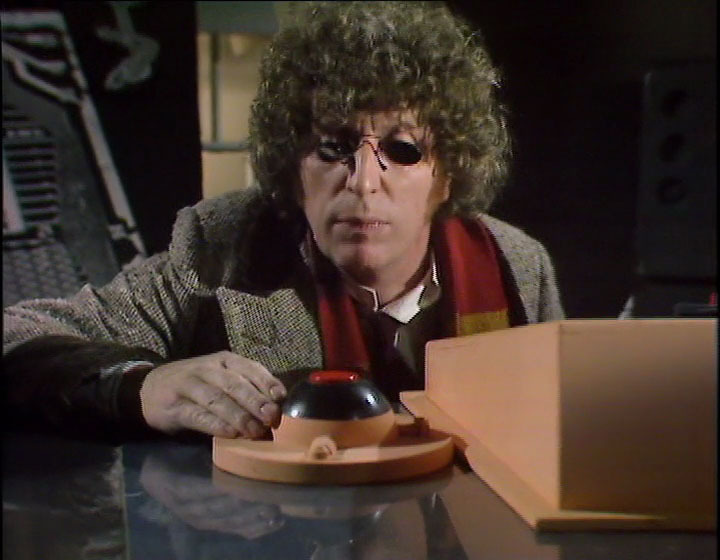 The Doctor wears a pair of dark tinted spectacles during episode four (see right). 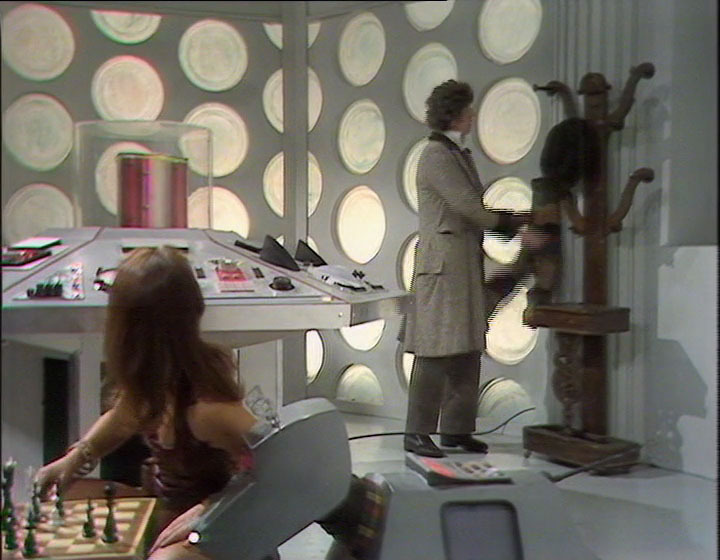 The Doctor is seen to return his hat and scarf to the console room hatstand at the end of the story (see left). The publicity photos for this serial must have been taken during recording of Image of the Fendahl, as Tom is wearing the outfit for that serial, although with a blue shirt, possibly his own (see right). The Doctor returns to the outfit worn in the preceding serial to be recorded, Image of the Fendahl. He starts by just wearing the printed velvet Prince Of Wales checked waistcoat; over the modern ivory dress shirt worn open collared without any tie or cravat; grey Donegal tweed trousers; and the brown leather brogue shoes. The console room hatstand has now changed from chunky mahogany to a lighter bentwood stand. It holds the Chestnut brown velvet frock coat, grey tweed frock coat, striped scarf and bottle green fur felt fedora hat. 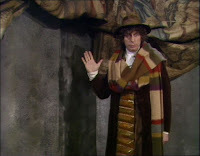 Leaving the TARDIS he adds the velvet frock coat and scarf to complete his outfit. The Doctor now wears a bit of a mix-and-match ensemble. 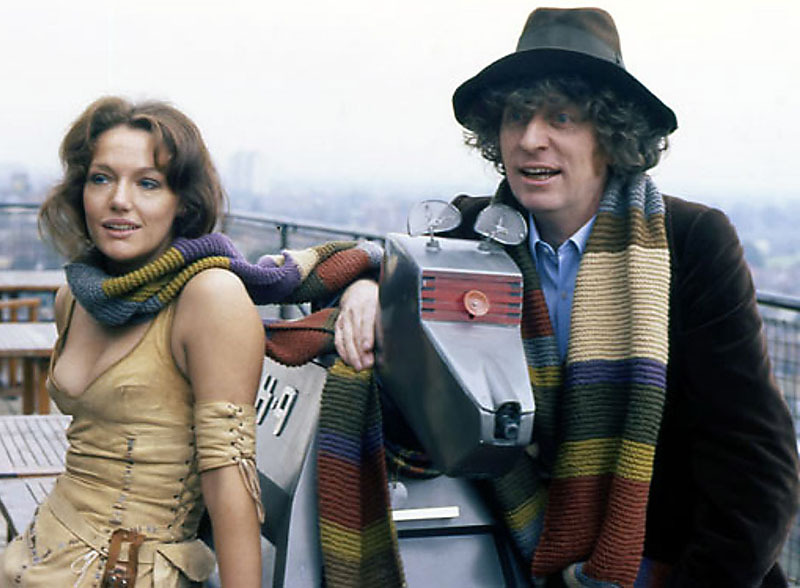 The only items carried over from the previous serial are the brown velvet frock coat; bottle green fedora; and Season 15 scarf (see left, top). From The Talons of Weng-Chiang he wears the floral-patterned waistcoat, worn unbuttoned (see left, second picture); and for the first time since debuting in The Deadly Assassin he wears the tunic fronted linen shirt with billowing sleeves; and the knee length leather cuff boots that were part of the same costume (see left, third picture). His tweed trousers are the wider legged worn with the suede cuff boots in The Face Of Evil (see left, third picture). Under the shirt he wears a new white cravat, which is tied inconsistently throughout the serial (see left, bottom). Finally of note, there is one scene where you can see a glimpse of his green braces under the waistcoat (see various pictures here). 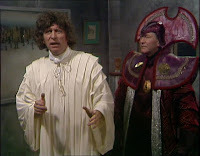 For his coronation, the Doctor wears a set of white robes (see above), though without an opening down the front or the giant ceremonial collar like the other Time Lords. After it, he wears the Sash of Rassilon for most of the rest of the serial (see left), although it’s mostly concealed by his scarf. When the serial opens The Doctor’s hat and scarf are on the console room hatstand (see above, left), but when he is having his clandestine meeting with the aliens on board their spacecraft, he is wearing the scarf (see above, middle). Upon returning to the TARDIS he is without the scarf, which remains on the hatstand (see above, right). Oops.